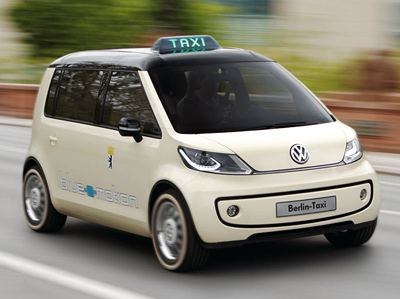 The Volkswagen Berlin Taxi was just one vehicle in a long line of electric powered concept cars from the Volkswagen, and the second proposal for an electric powered VW taxi. The first VW taxi concept was designed for the Italian city of Milan, and this one was tailored to suit the streets of Berlin. 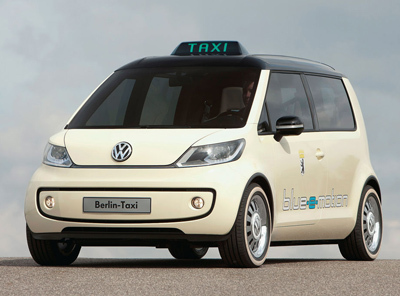 The Volkswagen Berlin Taxi concept was unveiled at an event called the "National Platform for Electric Mobility". The prototype model is designed to help explore new ideas for a next-generation taxi which could operate in a variety of highly populated areas and cities around the world. 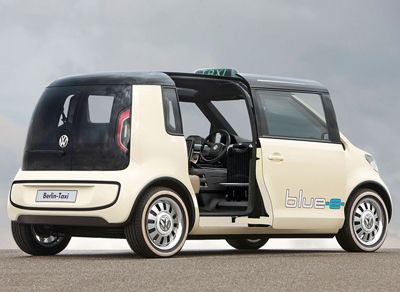 Powering the Volkswagen Berlin Taxi is an 85 kW motor which is fed by an under-floor mounted lithium-ion battery. Top speed of the vehicle is 75 mph (120 km/h), and the maximum range is a respectable 186 miles (300 km). The interior layout of the Volkswagen Berlin Taxi concept has been designed to be as practical and user friendly as possible. There's only one passenger door, located alongside the rear seats. This means that passengers can't exit the vehicle into moving traffic, as the door is located on the right side of the vehicle - away from traffic. There's no front passenger seat. Instead this space has been allocated as a storage area for the passenger's luggage. Like the Milano Taxi concept, the Berlin Taxi concept gets the same dedicated driver space which is high-tech and functional. The passengers also get their own meter display and the option of paying by credit card thanks to a small display screen located at the back of the center console.